Troubleshooting soy wax candles can be frustrating, especially if you're not used to working with or using soy wax. Soy is softer than paraffin, so you may need to tinker with your candles before you're happy with the end results. The number one reason you might be having trouble making soy wax candles is that you may be pouring the wax while it's still too hot. Soy wax needs to cool a bit after melting, and you should wait until almost the last second before pouring. Pouring too quickly after melting can cause many problems, including discoloration and trouble removing finished candles from molds. Before you change anything else, try pouring the soy wax at a lower temperature. If your candle is burning in odd ways, such as a tunnel straight through the middle or wax melting too quickly, the most likely problem would be the size of the wick. Other reasons for this are the addition of too much color or fragrance. It's also possible that too much air was incorporated into the soy wax while stirring or pouring. 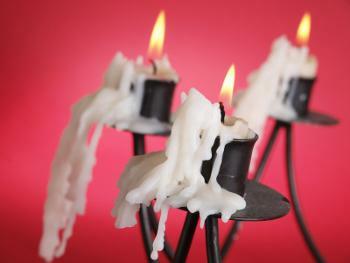 If candles are drippy, the wax is too soft. You can add beeswax or stearic acid to your melted wax before pouring to make it more stable. One of the main benefits of soy wax is that it doesn't produce much smoke while burning. If you experience a lot of smoke emitting from a lit candle, the most likely culprit is the fragrance oil or essential oil. Decrease the amount of oil used, or switch to a different brand or type of scent. Another possibility is that your wick is too large for the size of the candle. If you find that the scent just isn't enough in your candles, check the amount of fragrance or essential oil you are using. You should add up to one ounce per pound of wax. Also make sure that the temperature of the melted soy wax is right before adding the scent. It should cool slightly after melting to avoid the fragrance burning off, but not so cool that the oil can't melt into the wax. Another thing to check when making soy candles is that you're using good quality fragrance and essential oils. Cheap oils can be fine for paraffin candles since they burn hotter, but soy candles require a fragrance that can be effectively released at a lower temperature. Check labels, and when in doubt, ask if the fragrance you're considering is appropriate. If your finished candle has rough spots or the top isn't smooth, this is quite common and a natural result of soy wax candles. You can get around this by using a soy/paraffin or soy/beeswax blend. Often, the finished soy candle will look fine at first, but after one use the top is uneven or rough. This is also quite natural.You can smooth out small rough spots with the back of a heated spoon if desired. This doesn't always work with soy wax, but it's definitely worth a try if the rough spots bother you. Candle dyes can be very fickle, and if the wax is too hot when you mix in the color, it can fade fairly quickly. Other culprits for candle discoloration are burnt wax, some fragrance oils such as vanilla, and additives that have expired. If you find that you're having problems with your soy wax candles that require troubleshooting, the best way to figure out what's causing the problem is to start simple. Make a very basic candle using only wax and a wick. Burn this candle and see if there are any problems - if there are, then it's either the wick or the wax itself causing trouble. If this simple candle burns well, add your fragrance to the next one. Monitor the candle for problems, and continue adding dye and any other additives you would normally use. Eventually you'll discover which step is the culprit.